Calling All Foodies: Top 5 AKFF Food Trucks! Heading down to Abbot Kinney to enjoy some quick and tasty eats? Take our word for it and try one, two, or all five of our AKFF favorites. First Fridays is July 3, 2015! Ever wonder what would happen if a Mexican Food Truck and Korean Food Truck had a baby? 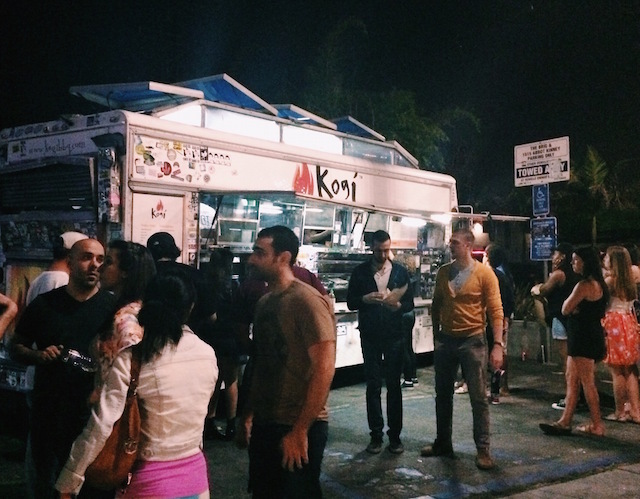 If the curiosity is killing you, try Kogi BBQ. Often spotted in the parking lot of The Brig, the famous Korean taco truck draws attention from every street corner. Fan favorite? Spicy pork burrito. Wet. This hunk of spice and savory will send you right back in line. This food truck is literally dripping with South Philly flavor in the heart of Venice. Choose your cheesesteak “wit” or “witout” onions. Our advice? Buffalo Steak “wit.” Every time. Go the full nine yards and order a side of fries topped with crabmeat. Take a break from your juice cleanse and indulge in cheesy goodness. If you’re looking for a combination of comfort-food and sassy fusions, the grilled cheese truck may be your foodie soulmate. Keep it classic with a plain and simple with a cup of tomato soup. Craving sophistication? Try the cheesy mac: fully loaded. Nothing says posh like BBQ pork and caramelized onions drowning in sharp cheddar. These are no basic hot dogs with a side of ketchup. 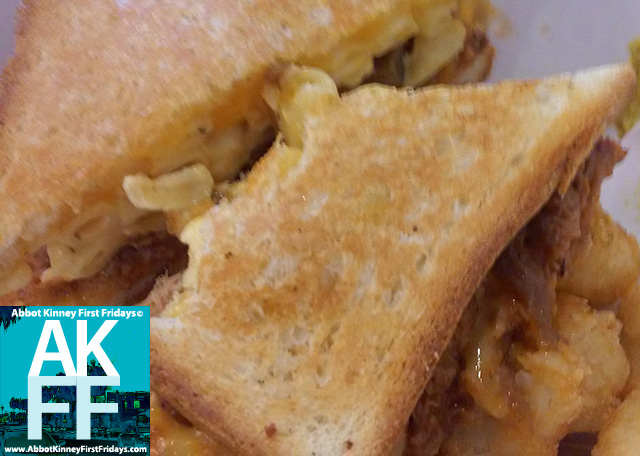 Angie’s Wiener’s is a force to be reckoned with and well-worth fighting tooth and nail to get your order in. Once you get to the front of the line… Lights. Camera. Action! Nothing makes you feel like a Hollywood superstar like Angie’s menu. Choose from “The Producer,” “The Director,” “The Diva,” and many more. Grow some bowls and try this delicious and nutritious gem at AKFF. Amazebowls is a diamond in the rough for all you trendy health nuts. What more could you ask for? Bright acai paired with crunchy granola and an assortment of fruits will leave you satisfied and guilt-free. Food Truck Scene Guide Coming Soon! Showcasing Los Angeles Area Food Truck Events Happening on a Regular Basis! Marvelous March at First Fridays! Food & Art Mashup! © Abbot Kinney First Fridays & Jagmedia 2008-2017. All Rights Reserved. Made in Venice, CA USA. No outsourcing!